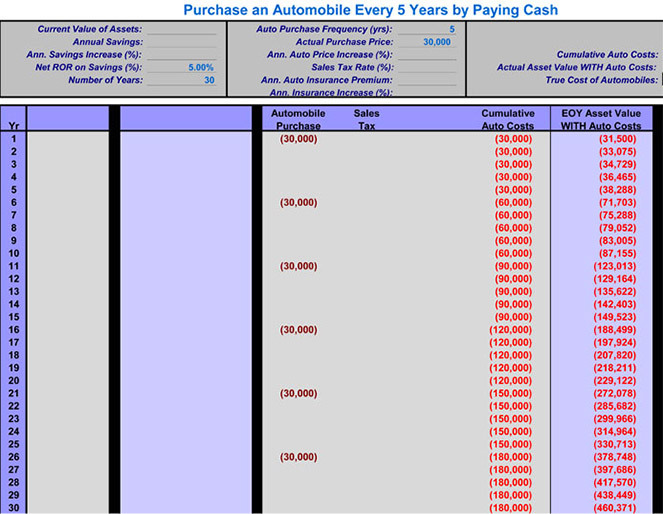 The Automobile Purchases calculator provides analysis of the true cost of paying cash for an automobile vs. financing the purchase. This calculator provides valuable insight to consumers about the instances when paying cash is not the right option because of interest opportunities available to them by putting the money to work in savings. Paying $30,000 cash for a car every 5 years (with no inflation) removes $460,371 from your asset base (assuming its earning a net 5%) even though the cars themselves only cost $180,000.